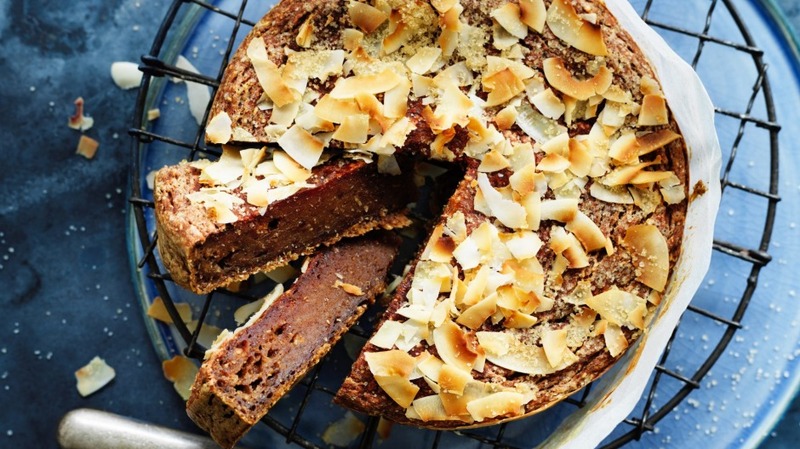 Delicately sweet and rich with coconut, this vegan and gluten-free cake has a simple but elegant bake-on topping, which means that once it's in the oven you can clean up and relax. I call it a "pearl cake" because of the tapioca pearls in the crumb, barely noticeable but the key reason it keeps so well. It stays soft for days, so you can make it ahead and store it in the cake tin. 1. Line the base of a round 18-centimetre diameter cake tin, and heat the oven to 180C (160C fan-forced). 2. Put the water in a saucepan, whisk in the cornflour, add the tapioca and bring to the boil, stirring constantly. Remove from the heat and scrape into a large mixing bowl. Whisk in the ground chia, turmeric and allspice, followed by the coconut milk and the vinegar. 3. In a small bowl mix together the desiccated coconut, white flour mix, bicarbonate of soda, baking powder and sugar. Stir the dry ingredients together evenly, breaking up any sugar lumps, then stir them through the tapioca mixture until just combined but no more (as the bicarb will have started to bubble). 4. Scrape the batter into the tin, then smooth the top with a very wet pastry brush. Sprinkle the top with sugar, then flaked coconut, and bake for about 40 minutes, until the cake feels firm and pulls away slightly form the side of the tin. The coconut turns a deep golden brown, so if you want it lighter, cover the top of the cake with foil for the last 15 minutes of baking. Leave to cool in the tin, then it's ready to serve. Tip: If you double the quantity for a lavish birthday cake, bake it in two tins rather than one large deep cake as it will bake more evenly that way. This recipe can be easily adapted for chocolate-coconut friands. For more vegan baking, try Dan Lepard's pea, basil and eggplant tart with tahini shortcrust pastry.